Garlic is an edible bulb used as a common cooking spice. It also is rumored to have medicinal properties that help reduce cholesterol, heart disease risk and lower blood pressure. Probiotics are good bacteria found in your body that maintain proper yeast and bacterial levels in your digestive tract. Garlic is a common ingredient in many food dishes. While garlic is consumed to help lower cholesterol and blood lipids, there is conflicting data on the effectiveness of the bulb, according to the National Center for Complementary and Alternative Medicine. Regardless of the health benefits, you may be consuming garlic strictly for the pleasure of the flavors it adds to pastas, sauces and other food dishes. Probiotics are naturally consumed in certain types of foods, such as yogurt, milk, miso and some fruit and soy drinks. The cultures are a bacteria that aids with digestion according to The Harvard Medical School Family Health Guide. Probiotics are used to treat or prevent post-antibiotic diarrhea, yeast infections and irritable bowel syndrome, and to hasten intestinal infection treatment. The consumption of garlic or garlic supplements does not have an effect on probiotics. Probiotic cultures are not increased or decreased by garlic, according to Dr. Melina Jampolis, physician nutrition specialist for CNN Health. Foods that do reduce the effectiveness of probiotic cultures are refined carbohydrates, such as breads and pastas. Soluble fiber increases probiotic effectiveness. Probiotics maintain the balance in the digestive tract, while garlic is thought to have its medicinal benefits in other parts of the body, namely your heart. Consuming garlic can have a positive effect or a negative effect on certain stomach conditions. Those suffering from irritable bowel syndrome may find increased stomach distress after consuming garlic. 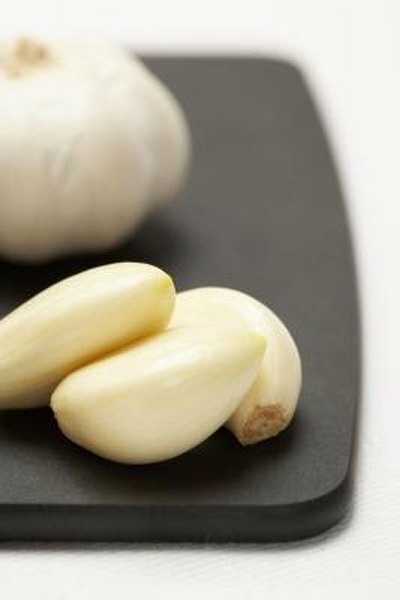 Other medical conditions, such as peptic ulcers and gastritis, can benefit from garlic consumption. Speak with your doctor about your specific medical conditions and whether garlic will help or harm your condition. Consult a doctor prior to starting any new supplement or dietary program. Talk to your doctor about the benefit of taking probiotics if you experience diarrhea when taking antibiotics. Garlic consumption should only be regulated when you have a medical condition that can be upset by it. Other than that, the only limitations to garlic is the supply of breath mints you may want to maintain.